The Associate in Applied Science Degree in Precision Machining Technology offers a broad training experience that prepares individuals for employment in the precision manufacturing industry. Students learn to operate a variety of conventional machine tools, computer numerical control (CNC) machines, read and analyze engineering drawings and use precision measuring and inspection instruments. The new computer automated manufacturing (CAM) lab uses Mastercam software to program the CNC equipment. Students develop the skills required for employment in this highly technical field. Graduates of the Precision Machining Program are employed as machinists, CNC machinists, tool and die makers, process quality control technicians, quality control inspectors, machine assemblers, machine tool designers, CNC programmers or field service representatives. 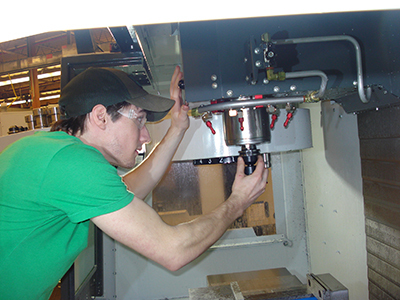 To provide students with an exceptional curriculum that encourages professional machining techniques necessary to succeed professionally. To support students in their pursuit of life-time learning and professional development. Express oneself in written and oral form. Prepared for employment as entry level machinists. Demonstrate entry level skills utilizing conventional and computer numerical control equipment in a modern manufacturing setting. Interpret engineering drawings utilizing current standards set by ANSI. Produce a part that meets print specifications utilizing the appropriate measuring and gauging instruments to insure quality control. Apply occupational health and safety standards related to the precision manufacturing Machine Tool Industry. Integrate all learning experiences gained from general education courses to the practice of the precision manufacturing machine tool trade. Demonstrate a commitment to life-long learning through formal education, on the job In-service or independent participation in other technical/trade resources.